and these three are for the current Tast. 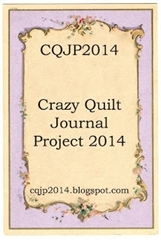 I used a section of a pattern from The Antique Pattern Library that Sharon pointed us to. The next used hand dyed silk green thread, hand dyed cotton for the Satin stitched flower. The Crossed Buttonhole and Bullions – sorry I have forgotten the name of this variegated thread. Lastly a funny green 2 strand DMC for the Crossed Buttonhole with DMC 2 strand green stem and the Oyster stitches were done with Perle 8. 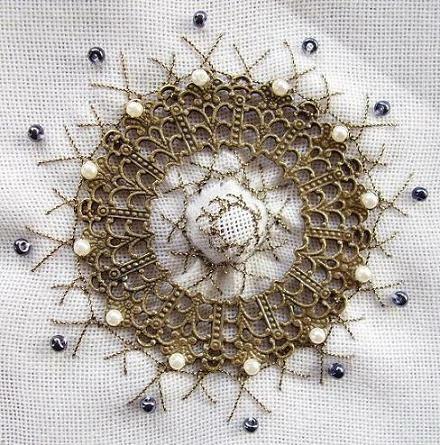 French knots and Black Pistil stitches used single strands of DMC rayon. I traced the first pattern and the others were hand drawn and therefore wonky. NOTE:- I had been asked by Rose how I made the medallion example. I meant to add it but forgot. I trapped a bead between two layers of fabric and worked the Crossed Buttonhole around and over this. 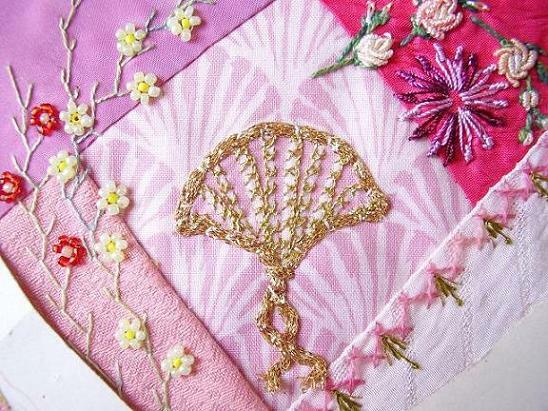 Then laid the metal charm over the centrepiece and stitched that down with pearl beads and more Crossed Buttonhole, using Silf thread, which, sadly, is not made anymore. You made four wonderful pieces with crossed buttonhole for TAST1 so it is not surprising that these three new pieces are as charming. Well done! Lovely work! I’m curious about the circle one, tried to find a write up in your blog but it didn’t show up. Would love to know more about this one. each and every detail is beautiful. good use of this stitch. 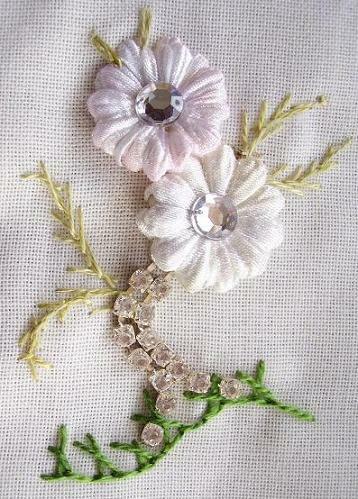 The crossed buttonhole is very good incorporated in the beautiful stitching that you did! What a lovely pieces! Thank you Miriam for your kind words. Thank you for the info. And for visiting my blog! All your work is just so lovely! Such inspiration! Such execution! Ah, to sigh over and savor. Lovely and inspiring interpretations.I love the metal charm sampler .